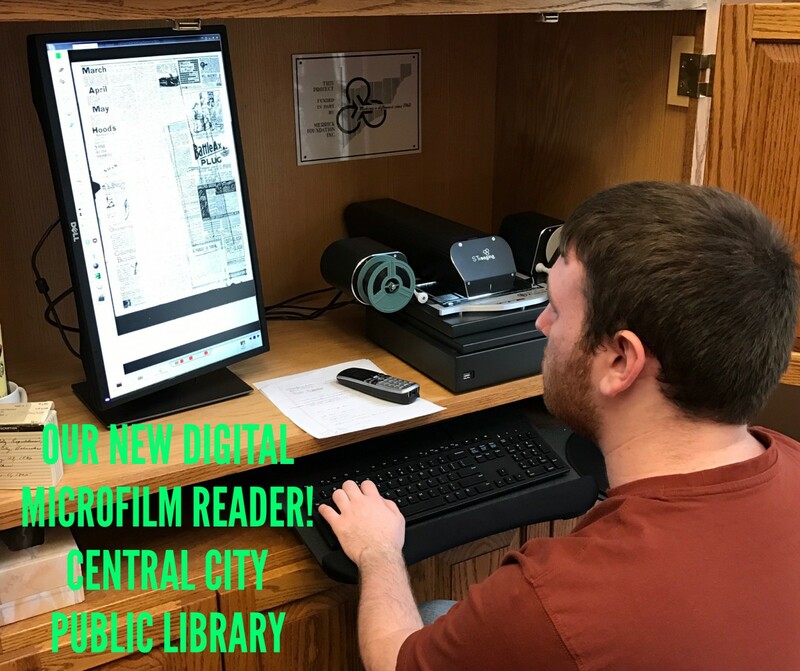 New Digital Microfilm Reader at Central City Public Library! Our patrons have really been enjoying the use of our new DIGITAL MICROFILM READER! Thanks to a new state-of-the-art digital microfilm reader system, our patrons can access the library’s microfilmed collection of area newspapers, with the latest technology available. The new system replaced a 13 year-old system that quit working shortly before it was replaced. The ST ViewScan III Digital Reader/Printer/Viewer/Scanner is equipped with ability to capture digital images from microfilm, microfiche and 16mm or 35mm film. The device is very user-friendly, with an abundance of options for image adjustments and editing. Users may save to a USB, Google Drive, Dropbox, email directly from the device, or directly to their Family Search account. The library staff is available to assist patrons with the new microfilm reader anytime during operating hours. This project was made possible through a grant from the Merrick Foundation, Inc, along with funds from the City of Central City and the Library’s endowment fund.